Here's a quick and easy chopped salad you can make on even the busiest weeknight, thanks to thawed frozen corn and OSCAR MAYER Real Bacon Bits. 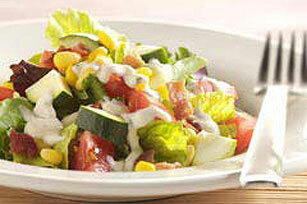 Toss lettuce with tomatoes, zucchini, corn and bacon bits in large bowl. Serve with whole grain bread and your favorite fresh fruit. For crisp salad greens, wash greens in cold water, then dry with salad spinner, paper towels or a kitchen towel. Store in a resealable plastic bag in the refrigerator until ready to use.